Well last week I was having the time of my life at a branding camp here in Montana for about six days. We stayed up in a pasture with a horse trailer for a cook wagon and branded calves every day. We would get up about 4:00-4:30 every morning and have a light breakfast with lots of good coffee. Somebody would wrangle the horses from the trap and the rest of the crew would hold a rope around the cavvy while folks caught their horses one at a time. Since we were out six days, I brought three horses of my own so they would each get an even ride. After everybody had a horse, the cavvy would be turned out again and we would go saddle up. When everybody was saddled and ready, we’d head out at a trot to wherever we were gathering that day. On one day, the branding pen was twenty miles from camp I think. All along the trot, our crew boss Brad would drop riders and assign them a certain part of the circle so that by the time he was done, there would be a line of riders all working together through the timber. Once we had a good bunch put together, everybody would end up back at the pen and we’d sort out a few cows, then the big fun would begin! Everybody hobbles their horses and helps haul the branding and propane pots out of the pickup and sets them up. Then some unlucky soul gets to pound in the nordforks with a sledge hammer. The way we set up the pen most days was instead of just having one gate opening to the fire we had two gates with the fire set up in some panels between them. One gate had two nordforks for dragging, and the other was just open for head and heeling (my favorite way to brand). Brad would pick as many ropers as he wanted for the first round, and then it was more fun from there on! I had a pretty new rawhide reata that I brought up there, and I had a lot of fun getting all the kinks figured out. The saying is true about reatas; they either make you look really good or really bad! My friend Caleb and I had each other figured out for head and heeling pretty well. We knew about how short on the rope to get and how fast to go to the fire for the other to heel. We both like a pretty fast moving calf to heel seems like. 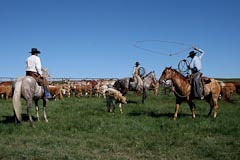 Well, after all the calves were done and kicked out, the pen would be picked up for the next day, and we’d ride back to camp. When we got back to camp and everybody unsaddled, we had the rest of the afternoon to eat, sleep and relax. Then the whole process would restart again the next day which made me extremely happy! Branding season is one of the biggest highlights of my year and I hope I can continue to help Brad and Della for a few more years! !